It's been too long people!! I have been so busy since I have last posted on here. I'm not sure you all knew, but during blog wars I was pregnant! And it was an extremely rough pregnancy (more on that later). I had a beautiful baby girl! 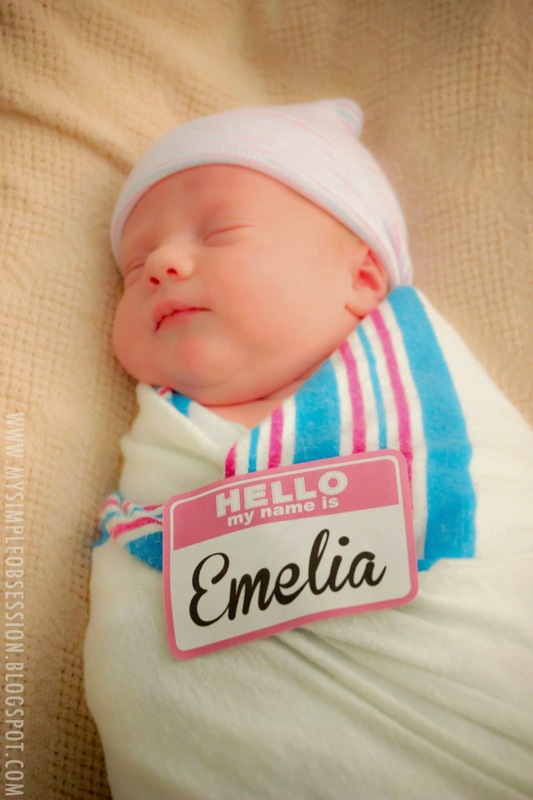 On October 21, 2013 we welcomed Emelia Rose into our family! We were so indecisive on picking a name. ( In other words, "The man" and I could not agree on any!) No one knew her name until she was born so we announced her arrival with the picture to the left. :) It was a cute way to announce it especially because I didn't do anything fun for when we told people we were expecting number 2! I made the custom sticker to put on her. She is now 5 months old and my world! AB just loves her little sister. She even asked me yesterday is we could figure out a way to get another one in my tummy. haha. ( 4year olds.) What else?….. I have been working like crazy. I am very thankful for how successful my home business has become. I was extremely busy around the holidays selling about 130 Grandkids signs. It was CRAY-ZAY! "The man" helped so much! And I have been also busy with new invitations and all the other fun party designs. I did a lot of crafting and designing for my BFF's wedding. Ashley just got married on 3/22/14. It was a gorgeous vintage/rustic wedding. And AB also just had her 4th birthday (Sofia the First themed) During my time away I have taken tons of photos of potential posts for the blog. It was always a, "Hey! That would be great for the blog!" So I will be able to have some old content but new for you guys. :) We are currently working on so many projects around the house that I'm going to have to focus on one to finish something so I don't have so many uncompleted projects and rooms, one of them being Emelia's room. :) I'm hoping to start that next week. The Seahawks won the Super Bowl!!! That made "The Man" so happy. Since he's from Washington and we live in Washington, They are his team. I will say they are mine by default. :) Although I do love college football and since I'm from Idaho and went to BSU, they are and forever will be, my team.